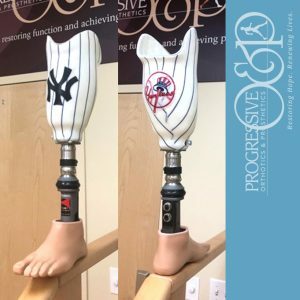 When Joe S. came to Progressive, his goal was to be able to walk into an engagement party for his niece unassisted; it had only been two months since his lower leg amputation. The team at Progressive O&P had the opportunity to help Joe realize his goal because another niece suggested he meet with Sal Martella, CPO, Co-Owner of Progressive and his associate Abe Mathews, CPO. Joe was in luck because this niece is also a Physical Therapist. Joe S. was an active 50-something working full time living in Queens and surrounded by a tightknit family. In 2017, Joe developed complications related to diabetes. After nine unsuccessful surgeries to remove several toes, he was left unable to put any weight on his foot his doctor. His surgeon recommended a below-knee amputation and the news devastated Joe. He equated the amputation with the end of his independence and any semblance of the life he loved so much. 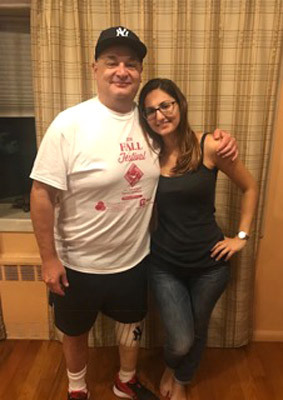 It was then Danielle DelGrosso, DPT, his niece and a Physical Therapist now working at North Shore University Hospital, took the opportunity to share her opinion and recommendations with her uncle. Danielle fully believed the amputation was the right decision in Joe’s case. Danielle shared stories of amputee patients in their 70s and 80s that she had worked with in her career who were able to walk, unaided after having an amputation and being fitted with a prosthesis. Danielle also shared other “social proof” to her uncle. We asked Danielle to elaborate on that as well as how she came to suggest Progressive O&P to her uncle. Progressive O&P’s Abe Mathews, CPO and Joe S.
Making Progress: Can you elaborate on the “social proof” you shared with your uncle and why you think it made a difference in his decision making? Why did you feel confident recommending Progressive O&P to your uncle? So often successful patient outcomes are linked to well-matched personalities between patient and clinician. As a young PT grad, I met Sal and Abe at my first job. 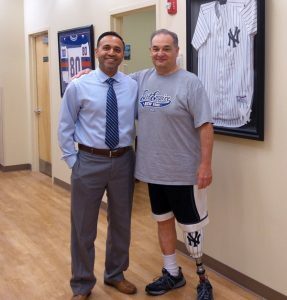 I had so many questions about my amputee patients, and Sal and Abe were always willing to answer my questions, share ideas and information, and made themselves available to answer my texts or take my calls. It was just really easy to work with them. From a clinical standpoint, they were incredibly attentive to our patients and always followed up. From a personality fit, Joe is a huge baseball fan and so is Sal (and everyone over at Progressive), so I knew the fit was right. You can see they even gave him a Yankees themed cover! What do you see as the role of the Physical Therapist in the recover post amputation? I see the role of the doctor is to make sure the patient heals and the role of the Physical Therapist is to keep the patient motivated, build their confidence, provide educational resources, and depending on the setting possibly suggestions for prosthetic care. PT’s spend at least an hour a day with amputee patients while they are in rehab and there is a bond developed during that time that is strong. My uncle still emails the Physical Therapist had at Rusk Rehab a year ago! If you’re wondering if Joe made it to the engagement party, not only did he walk in unassisted he danced with his own daughter. For more patient resources visit our Resource Page.